Who else loves a low carb big breakfast? Not every day but at weekends when you have more time, this is a real treat. 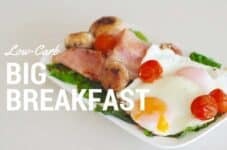 Big Breakfast – Low Carb and so much better than cereals. Cooking a big breakfast at the weekend is a nice treat. Add as many low carb vegetables as you can, lots of eggs and of course bacon. why not have a fully loaded big breakfast and add wilted spinach cooked in the bacon fat. Tasty and nutritious. If you want to know what is wrong with having cereals, grains and juice in the morning, this is an excellent post to read. If you understand what is wrong with cereals and grains, you will understand what is wrong with modern food production. You’ll thanks me that you can enjoy a big breakfast again, without the guilt the low-fat nonsense has given us. You won’t miss toast or cereals ever again. This is what we have been missing out on. Tasty and so nutritious. Add leafy greens and tomatoes for colour and antioxidants. Grains raise your blood sugars, raise your insulin, raise your appetite and cause fat storage. Now add that glass of juice in there and you’re over your limit for the day. Grains are highly processed and add zero nutrition to your day. Now mix it up and have a big breakfast instead, you have protein, healthy fats, vitamins, minerals, vegetables and nothing is falsified or fortified. It will also keep you fully for longer so you don’t get that insatiable need for morning tea. The ultimate LCHF big breakfast. This will keep you full, pretty much all day. Add plenty of low starch vegetables. There's not much of a recipe here but just to say go all out at the weekend and indulge in a big breakfast. I'm sure this is how most people think we eat every day - bacon and eggs. But it is the addition of as many vegetables as you can that takes it to another level and makes it so nutritious. Even add some cream cheese so the children will eat their greens. What else do you love to add to your big breakfast? I love wilted spinach, haloumi, zucchini, mushrooms, and butter – nom nom. 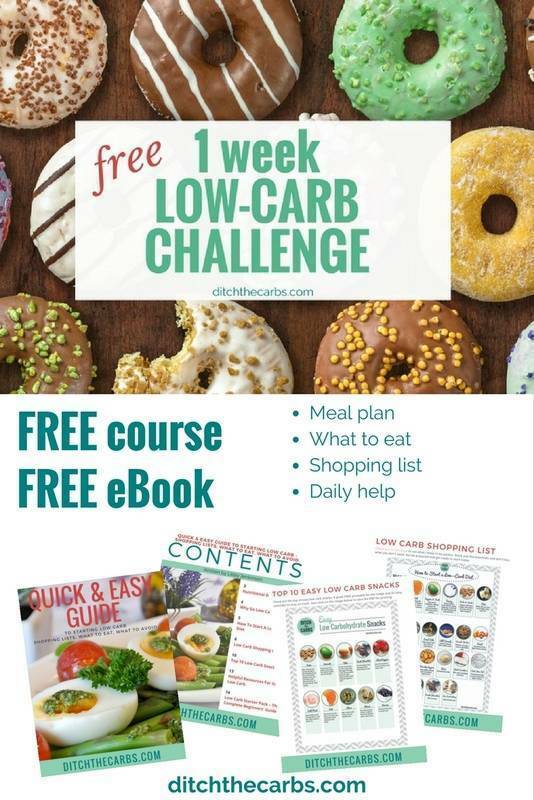 Where can I find the carbs etc. please? There are no nutrition panels in this recipe as I haven’t stipulate how many tomatoes, mushrooms etc so it would vary considerably for each reader. I , too, prefer to cook the bacon first and use the bacon fat to cook the rest of the Big Brekkie, if there is in sufficient fat in the pan I add a little butter. I understood that we should never cook with Olive Oil, but it is great to use in salads. Bacon fat is so yummy, especially to wilt the leafy greens with. I cook all the time with olive oil, unless you are heating it to smoke point, it is perfectly safe. This article on which fat to use might be worth a quick read. 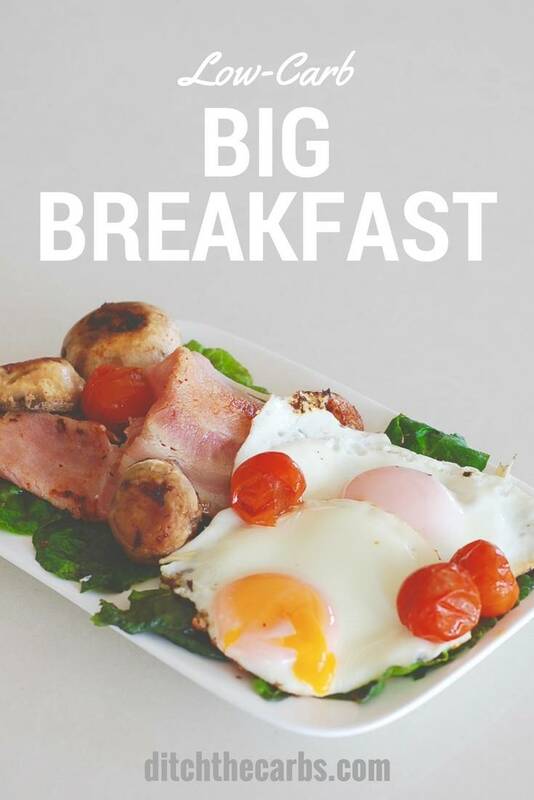 Love the idea of a big breakfast, especially on the weekends. Some people fry avocados and add that to their breakfast. Never thought of fried avocado, but it’s not so bad – interesting. What bacon do you recommend? 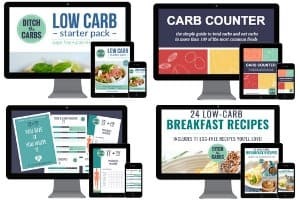 I live in the USA and many say that bacon is not so keto because of the high protein content and some have sugar even though the carb count is zero. The whole conversation about protein on keto is not so clear to me…Oh well, thanks so much for the big breakfast idea! I buy Henderson’s bacon here in NZ, it has minimal preservatives and processing. It is amazing. Keto and LCHF both advocate moderate protein, so roughly 1-1.5grams per kg of ideal body weight. High protein can kick you out of ketosis, but we don’t eat high protein. Remember bacon (and most meat) is not 100% protein, it has fat, water etc. Bacon is roughly 37g protein per 100g bacon. Where can I buy the bacon in N Y C? I have read so many conflicting reports about using extra virgin olive oil to fry. I have read that it is unstable and other reports say it is fine to use. Very confusing! I say cook the bacon first, then cook everything else in the bacon fat. Yum!